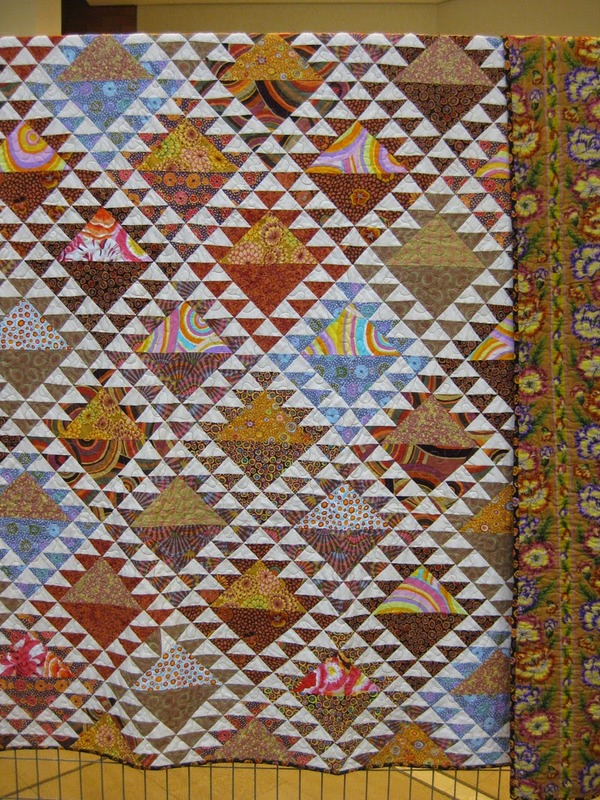 Stunning quilt created, sewn and quilted by Eleni. 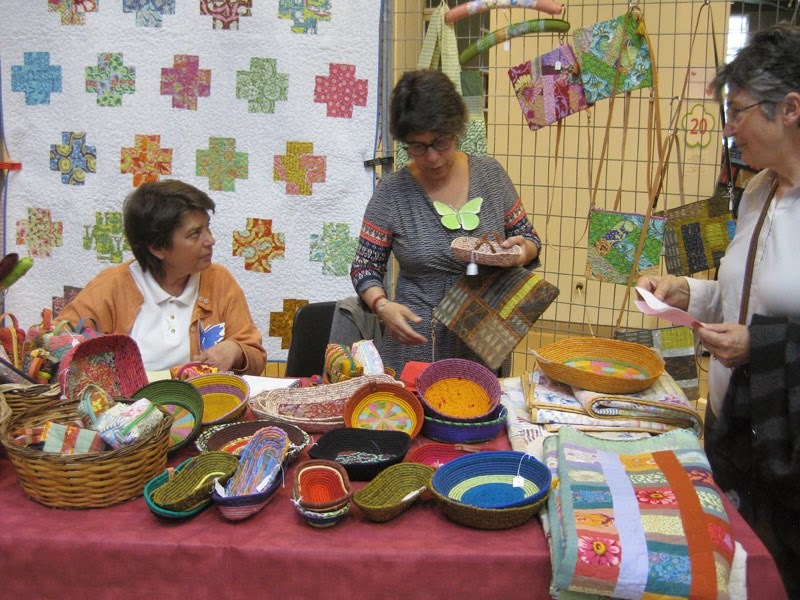 Easter is approching here in Greece and therefore various beautiful craft fairs are organized. This one, where I went last saturday, happened in Goulandri Museum in Kifissia. 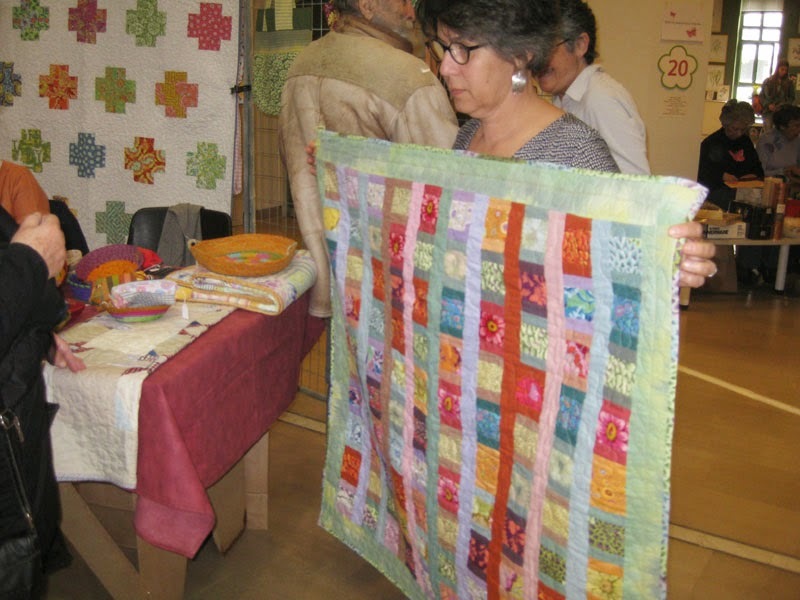 Our friend Eleni had a stall where she presented her last quilting creations. She is doing a wonderful job and is very successful! 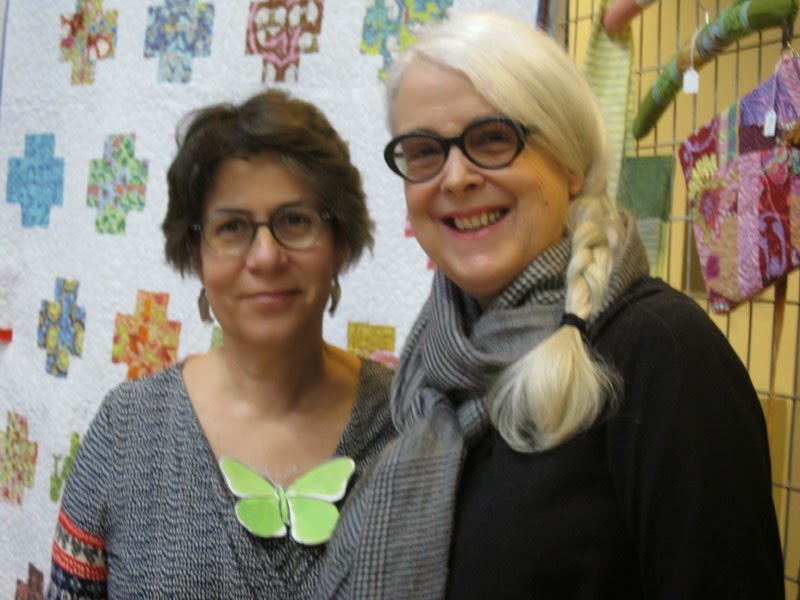 Behind the two ladies you can see a beautiful quilt with white background nicely quilted. Her colorful baskets where very much appreciated. My dearest friends Eleni and Michele. 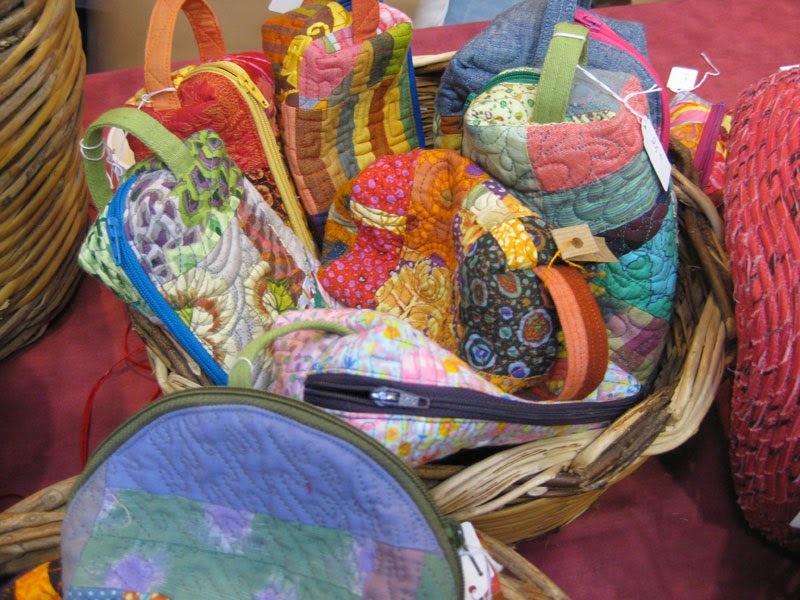 Those baskets, filled with joyful colored pouches are just a pleasure to look at! 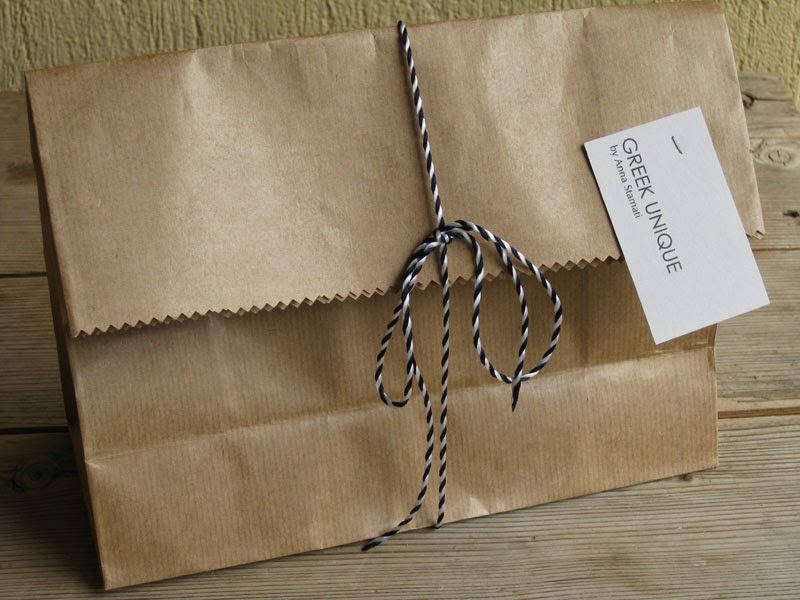 Anna, a young girl, fabric designer, was selling her wonderful creations, with a Greek inspiration. I really enjoyed this exhibition, having coffee, cakes and nice chats with my friends. This was a beautiful Saturday! 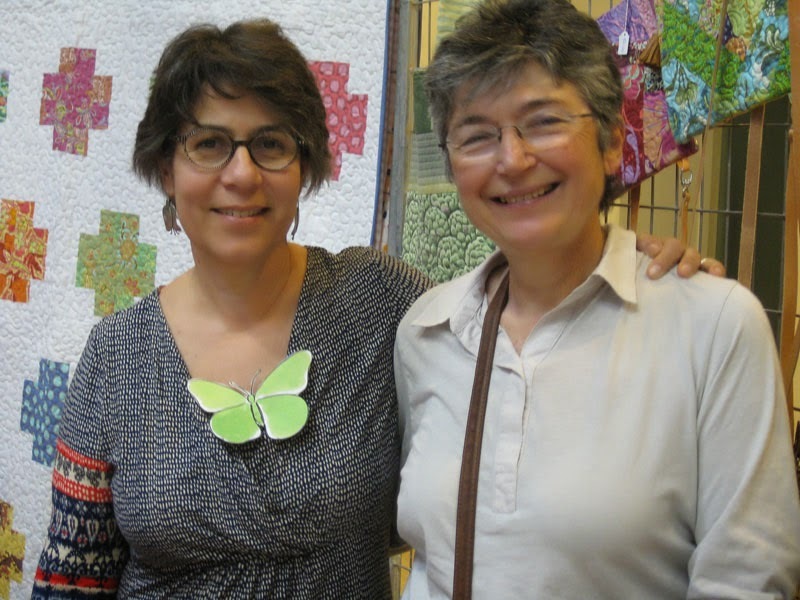 De belles rencontres et de beaux quilts !!!! Thank you for sharing your Saturday outing. 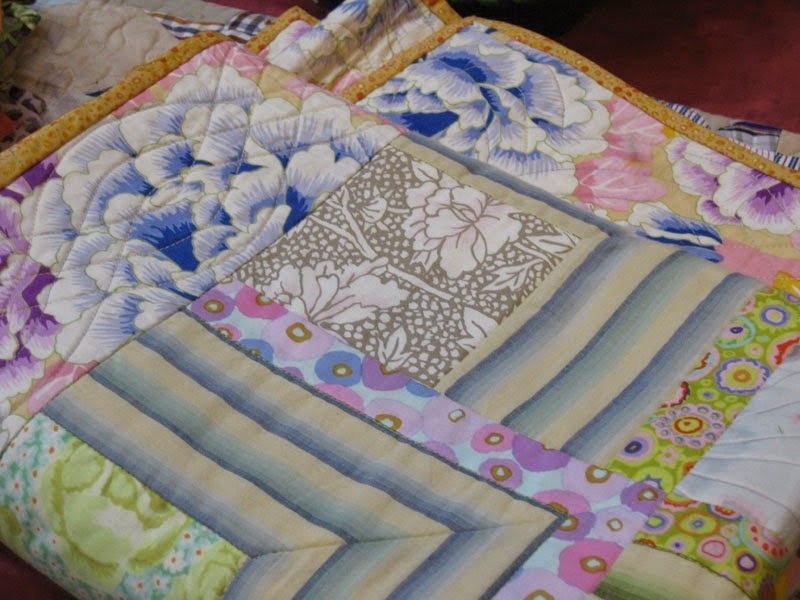 It is fun seeing what quilters are doing in other countries. 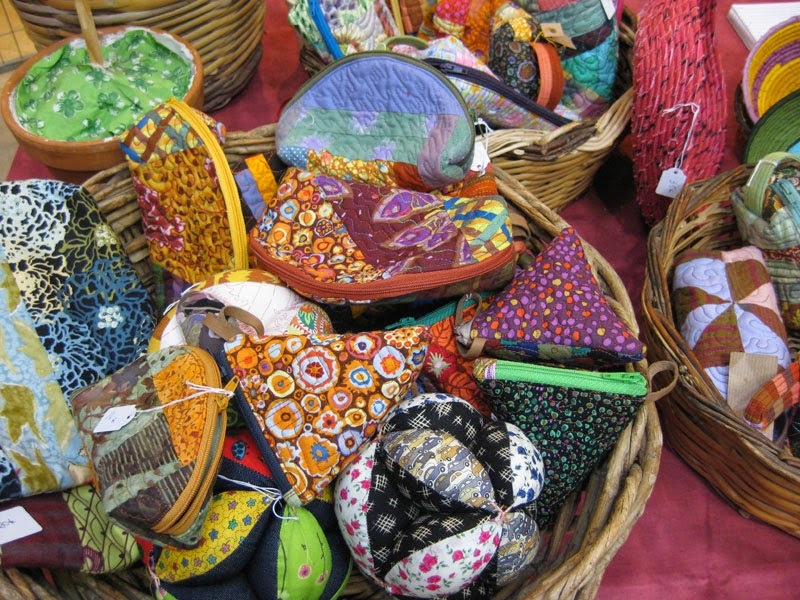 Oh the colorful baskets and pouches are just wonderful!! What a wonderful day! Be sure to link up this and your older basket post (and bunnies if ya have any) tomorrow at Tuesday Archives!! 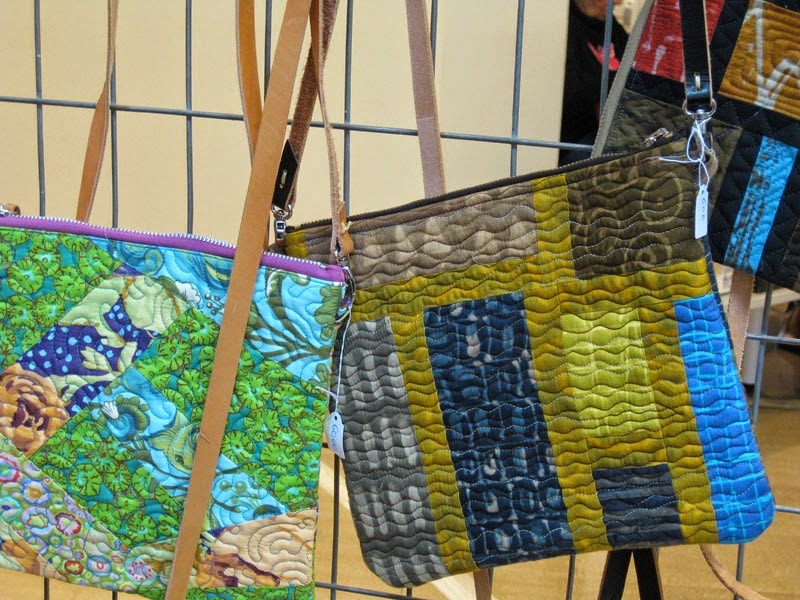 I love the quilted bags too!! So beautiful photos of all these gorgeous creations! Thank you Christine! What an inspiring exhibition. 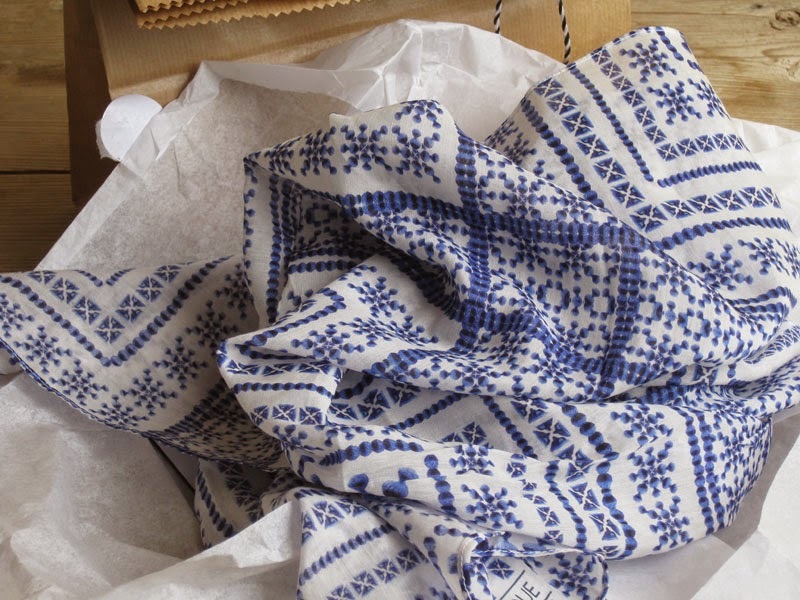 The scarf you bought is very pretty. 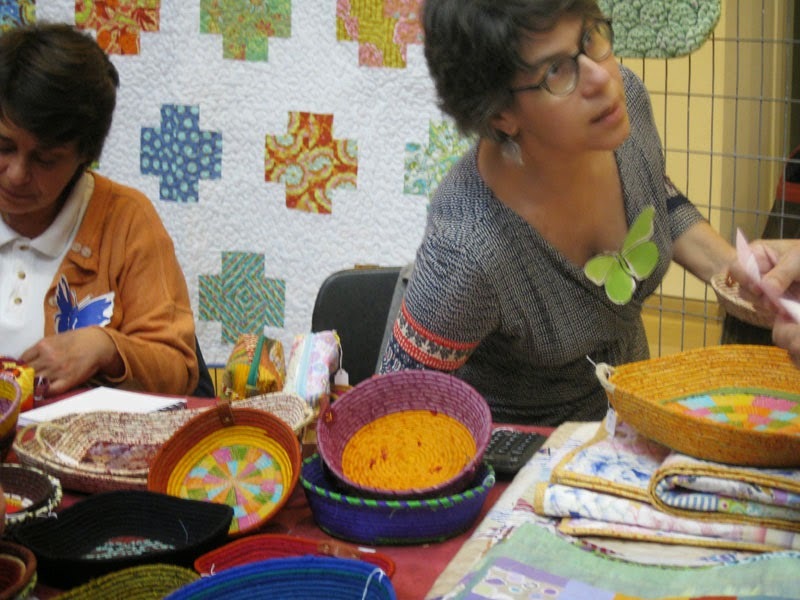 What a nice setting for selling quilts and crafts.